Is Tipping Mandatory in Australia? Tipping is still quite a contentious issue in Australia and New Zealand. As tipping is a custom that has yet to have really taken off within the more rural areas, only select businesses within metropolitan places have started to adopt this practice. So the question is, as a visitor, should you tip for good service? What is the common amount and do people generally tip? The problem in Australia is that there are no hard and fast rules to follow. One person will give you a completely different answer to another. This, in turn, makes it somewhat difficult to gauge whether a restaurant, let alone the waiters within the restaurant, expect a tip to be given. Generally, Australians and New Zealanders say tipping is not only unnecessary but also a practice to be avoided since it encourages service staff to pay better attention to those who seem like ‘good tippers’, or so the argument goes. With Australian workers operating in traditional service industries already receiving sufficient pay, there’s definitely no need for mandatory tipping. In fact, it can seem excessive. Furthermore, Australia workers in tourism and other service industries, on account of Australian law, are in no way able to enforce a mandatory tip. Because of this, it’s clear to see why the practice of tipping is yet to have distinctive rules and regulations. In many respects, tipping is relatively new and has been brought Down Under by those coming from ‘tipping’ societies, particularly Americans. If you had a great dining experience and a server who you feel is deserving, by all means, leave a tip. But do not feel remotely obliged to tip service every single time you interact with a wait staff server. As it’s a new practice, it’s not considered impolite if you choose not to tip. If you're in a popular tourist destination area, it is more expected to tip waiters in relatively upmarket restaurants, taxi drivers, and hotel workers who carry your luggage to your room or otherwise provide room service. 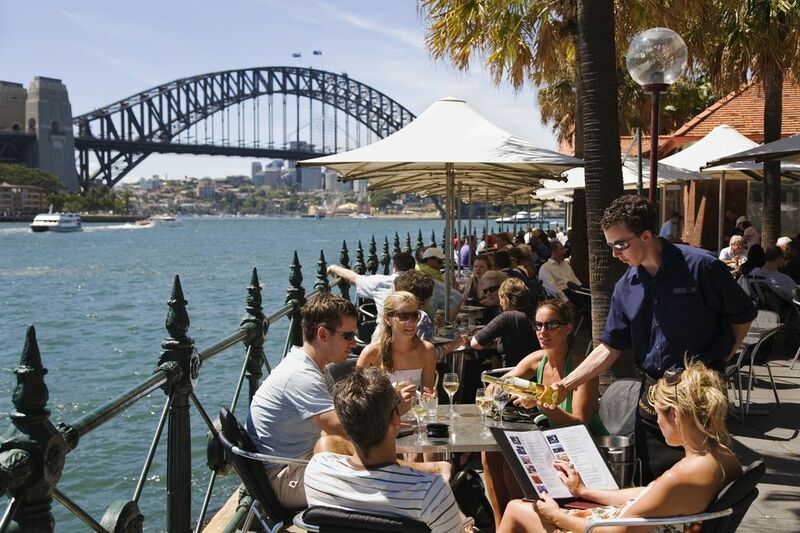 This would apply, for instance, in city areas in Sydney or Melbourne and visitor-oriented districts such as The Rocks and Darling Harbour in Sydney and Southbank and Docklands in Melbourne. The dilemma is in trying to figure out where, and when, you should or should not tip. When in doubt, go with your gut. If you’ve enjoyed your meal and your waiter was lovely, round your bill up to the nearest $10. If your taxi driver gave you some great tips on your drive from the airport, hand him an extra $5. You’re never going to hurt anyone’s feelings by tipping, but don’t ever feel like it’s expected, either. Taxis: Whether you’re in a major metropolitan area or a regional town, a small gratuity is always welcome. A maximum of 10 percent of the fare should be about right. In fact, if you get change from the money you hand to the driver for your fare, the small change in coins is quite often sufficient. Restaurant Waiters: Depending on the area and type of restaurant, again a tip of no more than 10 percent should suffice if you're pleased with the service. Typically a standard tip for a standard meal is approximately $5 per person, providing you have great service. Should you go to a more upmarket restaurant, a larger tip may be given. Hotel Room Service: For those who bring your baggage to your room, one to two dollars per piece of luggage is plenty. For those bringing in room service orders of food or drink, a small gratuity of two to five dollars is also more than enough. For hotel service, a standard tip of $5 is considered acceptable. For hairdressers, masseurs and masseuses, gym trainers and other personal service providers, tipping really depends on how much the service is worth to you above the normal charge. In most instances, these service providers rarely receive tips so anything you offer will be gratefully accepted.